After five years, I am considering the purchase of a new iMac. In migrating from the old to the new is the best choice Migration Assistant, Time Machine, or SuperDuper? It depends on the vintage of machines you’re migrating from and to. If the new Mac can run the same operating system as the old one, I’d lean towards using SuperDuper or Carbon Copy Cloner. However, if you can’t run the same version of macOS/OS X on both computers, a clone won’t work: it can’t boot on the new machine, and you need to pick Time Machine or Migration Assistant. In SuperDuper or CCC, make a full clone of your current computer, either as a disk image or as a mountable volume. Either way, you’ll need to be able to access this clone on the new machine. Start the new computer using macOS Recovery: hold down Command and R during startup until you see a macOS Utilities screen. Select the internal drive or boot partition in the list at left. From the Restore From popup menu, select your clone. If it’s a disk image, click the Image button to find it on a mounted drive. Click Restore and be prepared to wait a long while! When the restoration is complete, exit Disk Utility and select  > Startup Disk. Select the drive to which you restored your clone, and then click Restart. If you miss and can’t complete step 9, restart and hold down the Option key at startup, and select the startup volume you just restored. 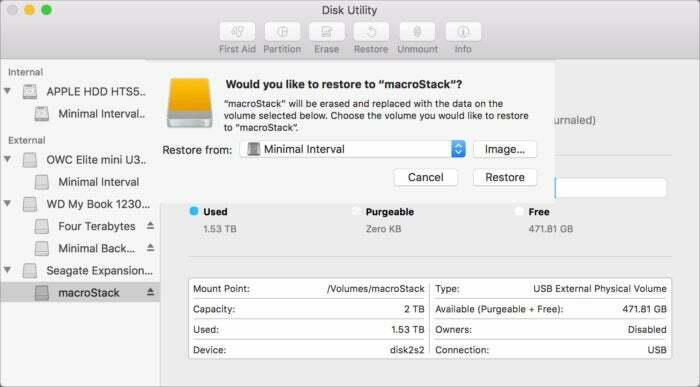 Disk Utility can restore a volume from another volume, including a disk image containing a clone. If this doesn’t work, it’s possible your old Mac doesn’t have all the system files necessary to work with your new Mac. You can also pursue Migration Assistant during initial setup of a new computer or after setting up an account. Migration Assistant can guide you through connecting another Mac, or you can select a Time Machine backup. I’m inclined here to recommend a Time Machine backup on an external drive that can be connected directly to the new machine. The process should be faster and have less complexity than connecting two computers.